distances from the hive. In addition to foraging for food, water and propolis, flight is involved in the mating of the reproductive castes and swarming. Also, the nest environment is actively controlled by fanning behavior. Temperature and humidity control, pheromone distribution, evaporation of water from nectar and regulating the concentration of respiratory gases are facilitated by fanning. The honey bee thorax is often referred to as the center for locomotion. It is the point of attachment for the six legs and both pairs of wings. The wings are not true appendages like the legs but are thin outgrowths of the skeleton which have been substantially modified for flight. The two pairs of wings are found on the posterior thoracic segments and articulate with the thorax in complex joints that allow a great range of movement (Winston 1987). The flight movements of the wing include an up-and-down component, a forward-and-backward component and a torsion, or partial rotary movement of the wing on its long axis (Snodgrass and Erickson 1993). The tip of the wing describes a long and narrow, slanting figure eight, the direction of movement being clockwise in the lower loop and anti-clockwise in the upper (Dade 1962). The wings of the bee are flat, thin, two-layered extensions of the body wall, strengthened by tubular thickenings called veins. The fore wings are much larger than the hind wings and their venation is stronger. The veins carry blood, breathing tubes and nerves to the wing extremities (Winston 1987). The two wings on each side work together in flight. To insure that the two wings beat in synchrony, the wings are provided with a coupling apparatus formed by a series of upturned hooks (hamuli) on the front margin of each hind wing, and a decurved fold on the rear margin of the forewing. 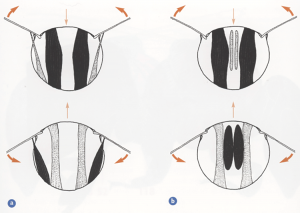 When the wings are extended in preparation for flight, the forewings are drawn over the hind wings, and the hooks of the later automatically catch in the marginal folds of the former (Snodgrass and Erickson 1993). Flight through the air is possible only when the movement of the air over the wings produces a force sufficient to counterbalance the downward pull of gravity. The force acting on the wings is usually analyzed into two components: a vertical force, the lift, equal and opposite to the weight and a forward force, the thrust, equal and opposite to the drag of the body. During a glide this ‘lift’ is produced by the forward movement, but in order to fly level or climb, the air current must be produced by movement of the wings themselves (Pringle 1976). 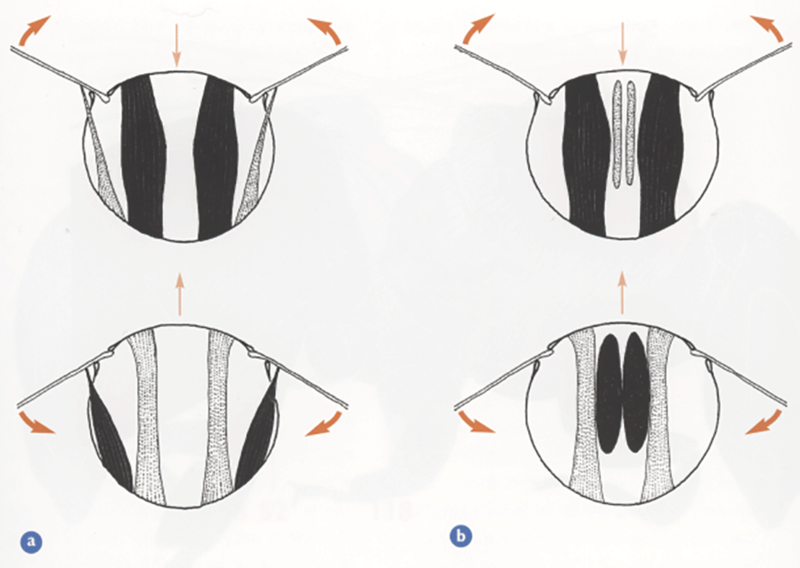 Within the honey bee thorax there are two main types of muscles that directly or indirectly move the wings (Goodman 2003). Direct muscles are attached to all the wings; four to each forewing, three to each hind wing (Dade 1962). The contraction of the longitudinal muscles and the relaxation of the vertical muscles extends the thorax vertically and drives the wings downward. In contrast, the relaxation of the longitudinal muscles and contraction of the vertical muscles bows the thorax outward, driving the wings upward (Winston 1987). Flight speed and distance depends on the powerful thoracic muscles being amply supplied with energy derived from nectar metabolism; if the blood sugar falls below 1% the bee can no longer fly (Dade 1962). A worker’s wings beat in flight at a rate of over 200 cycles/sec which according to anatomical and aerodynamic analyses of flight is not possible. 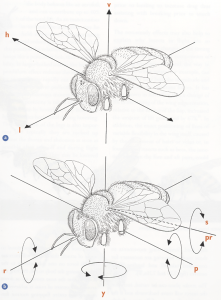 Thus there must be some special mechanisms in bees which sustain this high wingbeat frequency (Winston 1987). One mechanism involves the type of nervous control over flight muscles; since the nervous system cannot operate quickly enough to keep up with the speed of muscle contractions to sustain flight, the thoracic muscles resonate. That is, they contract more than once for each nerve firing (Esch and Bastian 1968; Esch 1976; Bastian and Esch 1970). The minimum temperature for active foraging is 46 to 50ºF (8 to 10ºC). The limiting factor is the temperature of the bee’s thorax. Bees must be able to keep the thorax above 86ºF (30ºC) for flight. Bees are able to elevate their body temperature, even though they are ectothermic (cold-blooded), by contracting their wing muscles to produce heat. At high body temperatures, the bees have the opposite problem – that is to rid the body of the excess heat generated by the flight muscles. The ideal external temperatures for flight is 66 to 86ºF (19 to 30ºC) (Caron and Connor 2013). the power requirements for flight and to remain active outside the hive across a wide range of air temperatures (Roberts and Harrison 1999). To determine the heat-exchange pathways through which flying honey bees achieve thermal stability, they measured body temperatures and rates of carbon dioxide production and water vapor loss between air temperature values of 21 and 45ºC for bees flying in a respirometry chamber. Body temperatures were not significantly affected by continuous flight duration in the respirometer, indicating that flying bees were at thermal equilibrium. Honey bees can maintain thoracic flight temperature at an extraordinarily high 46ºC by passing excess heat to the head by means of passive conduction and accelerated blood flow. This excess heat is then eliminated by regurgitated droplets of watered-down honey, which cools the head much like sweat in vertebrates. This prevents overheating while allowing the thoracic muscles to operate at peak efficiency (Heinrich 1979, 1980a, 1980b). While nectar foragers can extrude their crop contents for evaporative cooling of the body, pollen foragers lack this option (Heinrich 1979; Cooper et al. 1985). Thoracic temperatures affect flight force output and metabolic rate (Feller and Nachtigall 1989; Nachtigall et al. 1989; Coelho 1991; Hrassnigg and Crailsheim 1999; Harrison and Fewell 2002). Flying insects that transport loads that substantially increase body mass, require an increase in induced power, the component of aerodynamic power that creates lift (Ellington 1984). These increases by induced power can be generated by increased wing stroke amplitude, wingbeat frequency and/or the mean lift coefficient averaged over the stroke, which together require an increase in metabolic rate, assuming constant total efficiency of force production. Feuerbacher et al. (2003) investigated the effect of load carriage (pollen and/or nectar) on metabolic rates, thorax temperatures, wingbeat frequency during hovering, on wing kinematics and mechanical power output of flying honey bees. 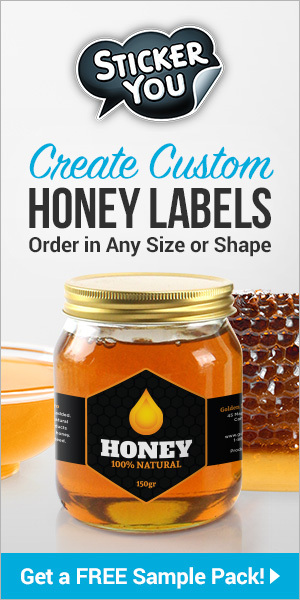 The loads carried by honey bees range widely and can approach their maximal lifting capacity. 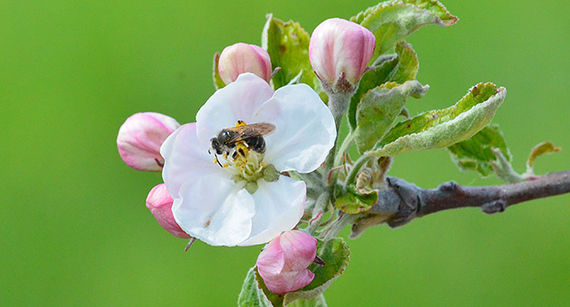 Foragers typically carry pollen and nectar loads representing 20% and 35% of body mass, respectively, maximally reaching 80% of reaching body mass (Winston 1987). The type of load carried (pollen or nectar) may also affect the metabolic cost of load carriage during flight. First, pollen is carried externally on the pollen baskets of the hind legs, whereas nectar is carried internally in the abdominal honey stomach, potentially causing the center of mass of the bee to differ with the two load types. Changes in the center of mass may alter body angles, wing positions and angles of attack, or may require correctional changes in the flight movements to changes in body angle (Feuerbacher et al. 2003). Pollen foragers had hovering metabolic rates approximately 10% higher than nectar foragers, regardless of the amount of load carried. Pollen foragers also had a more horizontal body position and higher inclination of stroke plane than measured previously for honey bees. Thorax temperatures ranked pollen> nectar> water foragers, and higher flight metabolic rate could explain the higher thorax temperature of pollen foragers. Loaded pollen and nectar foragers (mean loads 27% and 40% of body mass, respectively) significantly increased metabolic rate by 6%. Mean pollen loads of 18% of body mass had no effect on wingbeat frequency, stroke amplitude, body angle or inclination of stroke plane, but increased the calculated mechanical power output by 16-18% (depending on the method of estimating drag). A rise in lift coefficient as bees carry loads without an increase in wingbeat frequency or stroke amplitude (and only minimal increases in metabolic rate) suggests an increased use of unsteady power generating mechanisms. There is now increasing evidence that honey bees regulate their ground speed in flight by holding constant the speed at which the image of the environment moves across the eye (optic flow). Barron and Srinivasan (2006) investigated the extent to which ground speed is affected by headwinds. Honey bees were trained to enter a wind tunnel to forage at a sucrose feeder placed at its far end. Ground speeds in the tunnel were recorded while systematically varying the visual texture of the tunnel, and the strength of headwinds experienced by the flying bees. They found that in a flight tunnel bees used visual cues to maintain their ground speed, and adjusted their air speed to maintain a constant rate of optic flow, even against headwinds, which were, at their strongest, 50% of a bee’s maximum recorded forward velocity. Manipulation of the visual texture revealed that headwind is compensated almost fully even when the optic flow cues are very sparse and subtle, demonstrating the robustness of this visual flight control system. behavior, presumably due to effects on flight performance. Vance and Roberts (2014) investigated how experimental wing wear affects flight performance in honey bees. Variable density gases and high-speed videography were used to determine the maximum hovering flight capacity and wing kinematics of bees from three treatment groups: no wing wear, symmetric and asymmetric wing wear. Wing wear was simulated by clipping the distal-trailing edge of one or both of the wings. Across all bees from treatment groups combined, wingbeat frequency was inversely related to wing area. During hovering in air, bees with symmetric and asymmetric wing wear responded kinematically so as to produce wingtip velocities similar to those bees with no wing wear. However, maximal hovering flight capacity (revealed during flight in hypodense gases) decreased in direct proportion to wing area and inversely to wing asymmetry. Bees with reduced wing area and high asymmetry produced lower maximum wingtip velocity than bees with intact or symmetric wings, which caused a greater impairment in maximal flight capacity. These results demonstrate that the magnitude and type of wing wear affects maximal aerodynamic power production and, likely, the control of hovering flight. Wing wear reduces aerodynamic reserve capacity and, subsequently, the capacity for flight behaviors such as load carriage, maneuverability, and evading predators. 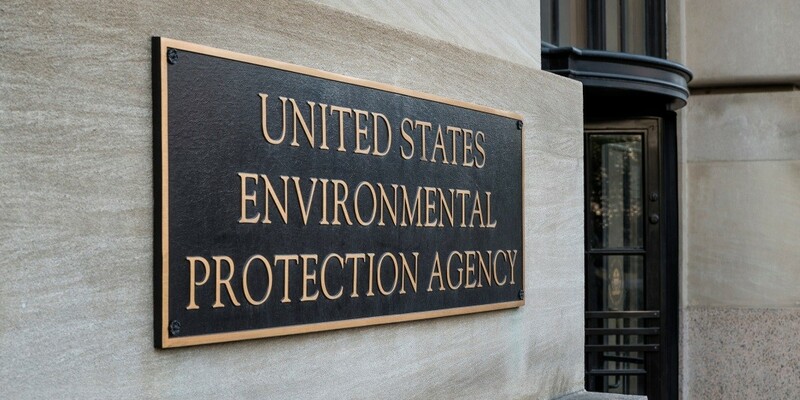 In pesticide risk assessment, estimating the routes and levels of exposure is critical. For honey bees subjected to pesticide spray, toxicity is assessed by thorax contact to account for all possible contact exposures. Poquet et al. (2015) tested six active substances with different hydrophobicity. They demonstrated for the first time that it is possible to induce mortality by pesticide contact with only the wings of the honey bee. The toxicities induced by contact with the wings and thorax were similar, with the wing median lethal dose (LD50) being 0.99 to 2.23 times higher than that of the thorax. This finding demonstrates that the wings represent a relevant route of exposure in the honey bee. Barron, A. and M.V. Srinivasan 2006. Visual regulation of ground speed and headwind compensation in freely flying honey bees (Apis mellifera L.). J. Exp. Biol. 209: 978-984. Bastian, J. and H. Esch 1970. The nervous control of the indirect flight muscles of the honey bee. Z. vergl. Physiol. 67: 307-324. Caron, D.M. and L.J. Connor 2013. Honey Bee Biology And Beekeeping. Wicwas Press, Kalamazoo, MI, 368 pp. Coelho, J.R. 1991. The effect of thorax temperature on force production during tethered flight in honeybee (Apis mellifera) drones, workers and queens. Physiol. Zool. 64: 823-835.
Cooper, P.D., W.M. Schaffer, and S.L. Buchmann 1985. Temperature regulation of honeybees (Apis mellifera) in the Sonoran desert. J. Exp. Biol. 114: 1-15. Dade, H.A. 1962. The Anatomy And Dissection Of The Honeybee. Bee Research Association, London, 158 pp. Ellington, C.P. 1984. The aerodynamics of hovering insect flight V. lift and power. Phil.Trans. R. Soc. Lond. B 305: 145-181. Esch, H. 1976. Body temperature and flight performance of honey bees in a servo-mechanically controlled wind tunnel. J. Comp. Physiol. 109: 265-277. Esch, H. and J. Bastian 1968. 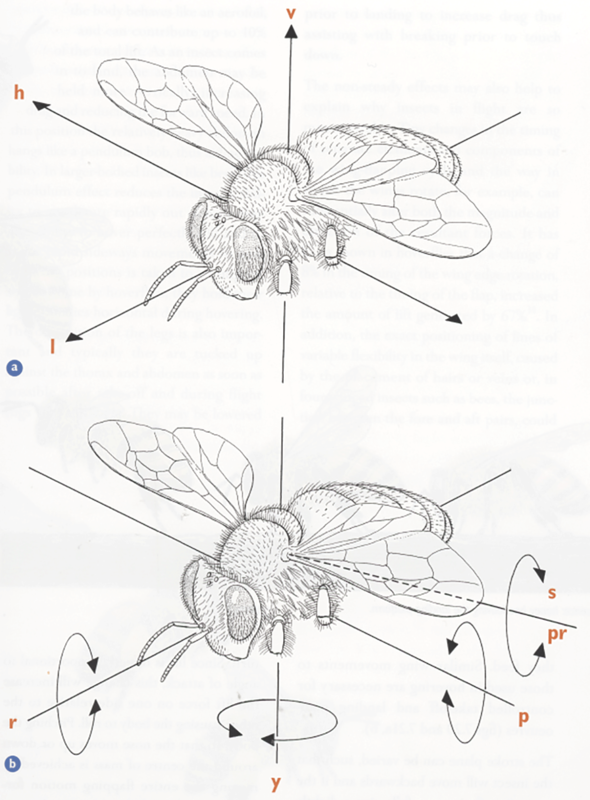 Mechanical and electrical activity in the indirect flight muscles of the honey bee. Z. vergl. Physiol. 58: 429-440. Feller, P. and W. Nachtigall 1989. Flight of the honey bee II. Inner- and surface-thorax temperatures and energetic criteria, correlated to flight parameters. J. Comp. Physiol. 158: 719-727. Feuerbacher, E., J.H. Fewell, S.P. Roberts, E.F. Smith and J.F. Harrison 2003. Effects of load type (pollen or nectar) and load mass on hovering metabolic rate and mechanical power output in the honey bee Apis mellifera. J. Exp. Biol. 206: 1855-1865. Harrison, J.F. and J.H. 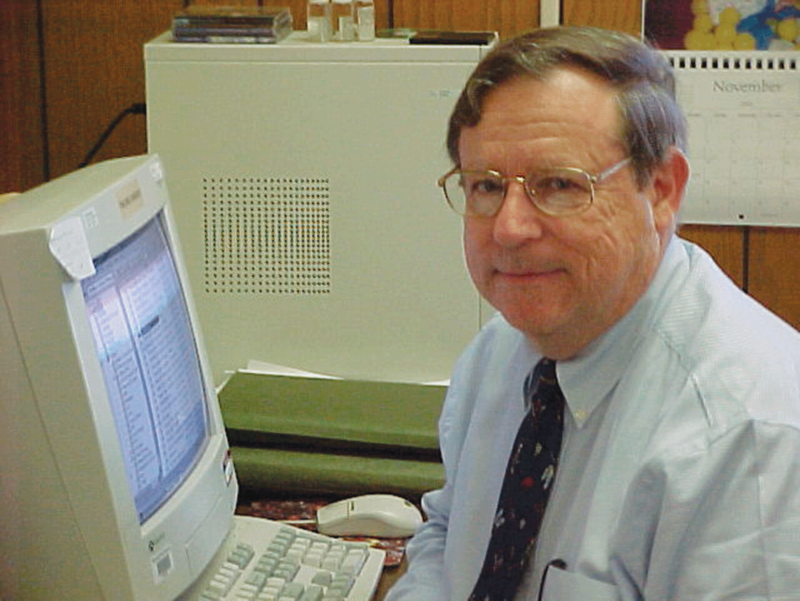 Fewell 2002. Environmental and genetic influences on flight metabolic rate in the honey bee, Apis mellifera. Comp. Physiol. Biochem. 133A: 323-333. Heinrich, B. 1979. Keeping a cool head: honeybee thermoregulation. Science 205: 1269-1271. Heinrich, B. 1980a. Mechanisms of body-temperature regulation in honeybees, Apis mellifera, I. Regulation of head temperature. J. Exp. Biol. 85: 61-72. Heinrich, B. 1980b. Mechanisms of body-temperature regulation in honeybees, Apis mellifera, II. Regulation of thoracic temperature at high air temperatures. J. Exp. Biol. 85: 73-87. Hrassnigg, N. and K. Crailsheim 1999. Metabolic rates and metabolic power of honeybees in tethered flight related to temperature and drag (Hymenoptera: Apidae). Entomologia Gereralis 24: 23-30. Nachtigall, W., U. Rothe, P. Feller and R. Jungmann 1989. Flight of the honey bee III. Flight metabolic power calculated from gas analysis, thermoregulation and fuel consumption. J. Comp. Physiol. 158: 729-737. Poquet, Y., G. Kairo, S. Tchamitchian, J.-L. Brunet and L.P. Belzunces 2015. Wings as a new route of exposure to pesticides in the honey bee. Environ. Toxicol. Chem. 34: 1983-1988. Pringle, J.W.S. 1976. The flight of the bee. In: Honeybee Biology, Geerings of Ashford Ltd., Kent, UK, J.B. Free, editor, pp. 65-76. Roberts, S.P. and J.F. Harrison 1999. Mechanisms of thermal stability during flight in the honeybee Apis mellifera. J. Exp. Biol. 202: 1523-1533. Snodgrass, R.E. and E.H. Erickson 1992. The anatomy of the honey bee. In The Hive And The Honey Bee, Dadant and Sons, Inc., Hamilton, IL. pp. 103-169. Vance, J.T. and S.P. Roberts 2014. The effects of artificial wing wear on the flight capacity of the honey bee Apis mellifera. J. Insect Physiol. 65: 27-36. Next articleClub Success At Events . . . Get Volunteers And GO!